With so many parties and so much great food, the holidays can be a challenging time of year if you’re trying to watch your weight and your waistline. How can you treat your taste buds without sacrificing a good time? 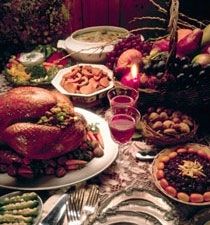 Eat sensibly on the day of your holiday dinner. Be sure to have a moderate breakfast or brunch before the big dinner arrives. This will help make sure you don’t come to the main meal with a full appetite and a fuller plate. Eat the right appetizers. Those hot dogs in a blanket and miniature egg rolls are certainly tasty but they can really pack on the pounds. Each bite contains about 100 calories or more. Choose to eat fresh vegetables instead (without the dip, of course) or, if that’s not an option, simply limit your portions. Go skinless. Eating turkey? Leave the skin behind. Just two ounces of skin will tack an additional 220 calories onto your meal. Opt for white meat with fewer calories and less fat. Think small. Limit yourself to about 4 ounces of turkey, ham, brisket or veal. Don’t have a scale close by? A 4-ounce serving is about the size of the palm of your hand. Fill up on water. Alcohol and coffee can dehydrate your body. Drink plenty of water to fill you up before you chow down. Raising a glass and making a toast? Limit your alcohol intake to one or two drinks. Go low-fat. Instead of mashed potatoes, fried foods or heavy gravy, choose salads and non-starchy veggies. Say “no” to sugar, brown sugar and syrup. Just can’t help yourself? Moderation is key – a small helping size will keep you satisfied and in control. Pay attention. Eat slowly and savor each bite. You’ll be less likely to overindulge. Then, when midnight strikes on December 31, make it your New Year’s resolution to exercise and eat healthy.